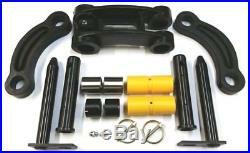 This is a Brand New Mini Digger Tipping Link & Dipper End Pins & Bushes Set for JCB. 231/03901, 811/90697, 1450/0001, 332/T4657, 809/00108, 808/10006, 911/23900, 809/10038 & 826/00600. This part will fit various JCB Models but you need to check suitability for your machine by giving us your. If no JCB Machine Serial Number. Is given before purchasing, we will dispatch this part as advertised with JCB Part Numbers mentioned above. The Price is GBP 292.00. We accept the following. Parts are supplied per below terms and conditions. Part is supplied according to JCB Part Number mentioned in this listing. Part supplied will be according to the JCB Part Number mentioned in this listing. Suitability of part can also be checked by giving us their JCB Machine Serial Number so we can check if part is correct for customers machine. Part in listing is for use on JCB machine only, any use on any other machine is solely at buyers risk and responsibility. OEM Part Numbers mentioned on listing are for reference. We do not imply that any part is a product of these manufacturers. The item “JCB PARTS – MINI DIGGER TIPPING LINK & DIPPER END PINS & BUSHES SET” is in sale since Wednesday, August 23, 2017. This item is in the category “Business, Office & Industrial\Industrial Tools\Construction Tools\Excavators”. The seller is “abelpartsuk” and is located in Hounslow, Middlesex. This item can be shipped worldwide.